Flooring contractors are invited to join Vermont Natural Coatings and Norton Abrasives in Hardwick, Vermont from March 21-24, 2017 for an Expert Sand and Finish School. 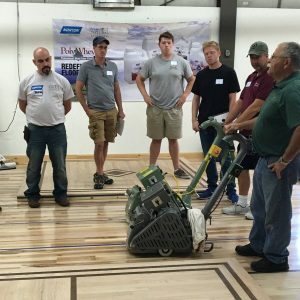 Take your skills to the next level with a week of hands-on sanding and finishing training and the opportunity to work with Norton Abrasives products, including Norton | Vermont Natural Coatings PolyWhey Professional Wood Floor Finishes and the full line of LÄGLER professional floor sanding equipment. NWFA certified experts provide personalized training at our headquarters, covering all phases of the sanding and finishing process. You’ll master advanced sanding techniques for minimizing scratch patterns and getting an optimal finish on all species of wood and parquet floors, how to work with custom colors, bleach and dyes, and how to make seamless repairs in stained floors. There’s no Sand and Finish School like ours. Attendees spend their days learning from the industry’s top instructors. Plus, all lodging and meals are included. You’ll be staying at a historic inn, experiencing Vermont’s foodie culture with award-winning local food and drinks and taking in the state’s beautiful scenery. Cost: $500 per person. All meals and lodging included. Receive $100 in free product per company and three NWFA credits. To reserve a place please contact Audrey Hix by March 7 at 802-473-3292 or ahix@vermontnaturalcoatings.com. For more information, a PDF is available for downloading.